Well I am trying to get a jump start on my Christmas cards this year. I made this one tonight. I have several stamped and the scallops ready and the side strips done, just gotta ink and put them together. I used a Inkadinkdoo stamp set for the sentiment. 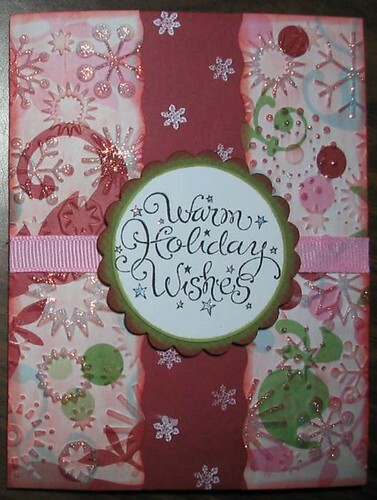 I used the snowflake cuttlebug folder for the embossing, a small snowflake stamp from the Studio G series 12 December set. I used Cat eye ink for inking the edges. Oh yeah and STICKLES! Used Stickles on the stars - diamond! Okay I couldn't resist adding some Stickles to the cards!! NOW I LOVE THEM!! I really like those cards. Beautifu cards as usual. You are right the stickles add just the right touch. WOW!! Those Rock!! amazing as always okie!!! I also nominated you for an award for your blog!! Check out my froggaritaville blog for details!! Okie, I love your cards. 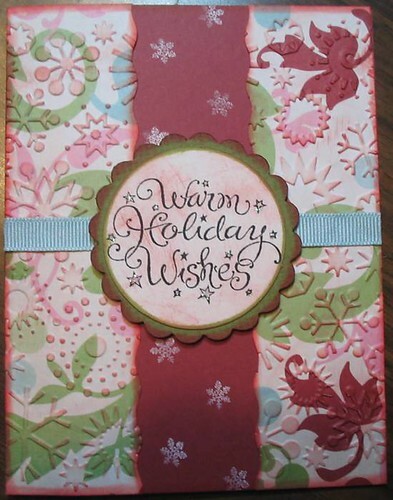 I really like how you embossed on patterned paper. Okie, they are gorgeous! As usual, you inspire me :-) I LOVE stickles! They sure make the embossed parts POP. Really great cards! Happy scrapping. The cards are so pretty and festive. Love the stamps! I just got my 1st bottles of stickles. I can't wait to try them out! These look fabulous !! so festive and the stickles is the perfect touch !! 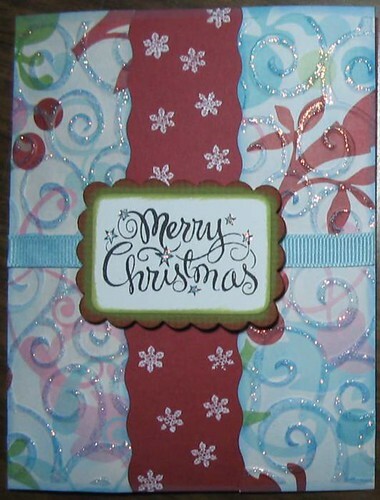 Very Pretty Christmas Cards! Great idea to do the snowflake on the cuttlebug! You never fail to amaze me. These are just beautiful! If I could have just a tiny little fingernail full of your talent I would be so happy! I like the touch of Stickles!! TFS!